Hezbollah's deputy leader, Naim Qassem, disputes Netanyahu's claim that Hezbollah controls the government of Lebanon. Hezbollah's deputy leader, Naim Qassem, on Sunday responded to Prime Minister Binyamin Netanyahu, who told a delegation of UN ambassadors that Hezbollah controls the government of Lebanon, which means Iran controls the government of Lebanon. 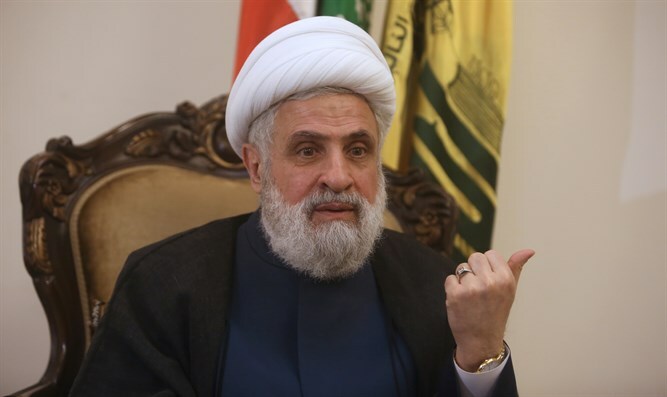 Speaking in an interview with the Lebanese OTV network and quoted in Yediot Aharonot, Qassem claimed the new Lebanese government was "a national unity government of which Hezbollah makes up 10%." Qassem also said, "I do not think that Israel can enter a confrontation with Lebanon because the conditions are complicated and Israel is not interested in war. If it wants to start a war, we're prepared." Last Thursday, nearly nine months after the elections in Lebanon, a new government headed by Prime Minister Saad Hariri was announced. Hezbollah and its allies gained more than half the seats of the 128-member Lebanese parliament in the election which took place in May of 2018. Hariri, the incumbent Prime Minister, was tasked with forming the next coalition despite his party’s significant losses in the vote. Hariri, who is backed by Saudi Arabia, included Iranian-backed Hezbollah in his last cabinet as well. The 30-seat government sees an increase in the number of ministries affiliated with Hezbollah. For the first time, the group now holds the Ministry of Health, which has one of the country's largest budgets. Hariri had warned against Hezbollah holding the Health Ministry fearing it would be hit with sanctions. A State Department official in December expressed concern over Hezbollah’s rising clout in Lebanon and said the United States hopes Lebanon's next government will work with it on areas of mutual interest.